KXLN Univision 45 today announced it has finished as the No.1 broadcast station among Adults 18-49 and Adults 25-54 during July 2013 sweep period, in the key dayparts of primetime, early evening local news, late local news and total day viewing, regardless of language. 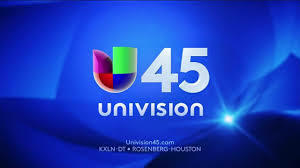 · During the July sweep more Houstonians watched KXLN Univision 45’s primetime programming than all other broadcast stations, including all the major English-language network affiliates: KTRK-ABC, KHOU-CBS and KPRC-NBC. · KXLN Univision 45’s primetime averaged 109,000 (3.9 rating) Adults 18-49 viewers. · Univision’s 10th Annual “Premios Juventud” youth awards show telecast on KXLN averaged 157,000 (5.6 rating) Adult 18-49 viewers and was the No. 1 program of the day (7/18/13). The award show also saw ratings growth of 56% over the 2012 broadcast results among the key adult demo. · KXLN’s Noticias 45 a las 5” (News 45 at 5) and “Noticias 45 Edición Nocturna” (News 45 Evening Edition), are the No. 1 early evening and late local newscasts among Adults 18-49 and Adults 25-54 ahead of local ABC, CBS, NBC, FOX and the CW affiliates in Houston according to the July 2013 sweep results. “Noticias 45 a las 5” weekdays at 5 p.m. finished as the No.1 early evening newscast averaging 52,000 (1.8 rating) Adult 18-49 viewers, more than 100% higher than the No. 2 stations, KTRK-ABC and KHOU-CBS, both averaging 25,000 Adults 18-49. “Noticias 45 Edición Nocturna” weekdays at 10 p.m. ranked No. 1, averaging 99,000 (3.5 rating) Adult 18-49 viewers. It has also been the most watched 10p.m. local news for the last 11 consecutive July sweeps among Adults 18-49. · KXLN’s is the broadcast station for soccer. The CONCACAF Gold Cup match between USA and Cuba on 7/13/13 garnered 336% more Adult 18-49 viewers than the same match on KRIV-FOX. · KXLN’s quarter-final match of the CONCACAF Gold Cup on 7/21/13, USA vs. El Salvador, averaged 75,000 (2.7 rating) Adults 18-49, 226% higher than KRIV-FOX’s telecast of the same match. · KXLN finished the July 2013 sweep as the No. 1 broadcast station in total day viewing averaging 48,000 (1.7 rating) viewers Adults 18-49, 128% more than No. 2 KTRK-ABC. Source: The Nielsen Company, NSI, July03, July04, July05, July06, July07, July08, July09, July10, July11, July12, July13 (06/27/13-07/24/13) sweep. Live+Same Day. Primetime based on KXLN, KTRK, KHOU, KPRC M-Sat 7:00p.m.-10:00p.m./Sun 6:00p.m.-10:00p.m. and KRIV, KIAH M-Sat 7:00p.m.-9:00p.m./Sun 6:00p.m.-9:00p.m. ; early evening local news based on KXLN, KPRC, KRTK, KHOU and KTMD M-F 5:00p.m-5:30p.m. ; KRIV, KIAH, M-F 5:00p.m.-6:00p.m. ; late local news based on KXLN, KPRC, KTRK, KHOU and KTMD M-F 10:00p.m.-10:30 p.m.; KRIV, KIAH, M-F 9:00p.m.-10:00 p.m. ; total day based on M-Sun 6:00a.m.-2:00a.m, all stations.